Spotify is one of the best apps out there for finding new music and listening to songs from your favorite artists. It's available in both a free version and a premium version. It might not seem like it was that long ago that you kept compact discs in your house and your car. Any time that you wanted to listen to music, you just popped one of those discs in your player. Software let you rip songs from the discs you owned to create mixed discs that you listened to and shared too. Later programs let you listen to your favorite radio stations and search for music online. Spotify offers users a new way to listen to songs from new and popular artists. Spotify is a great program that combines elements from different apps. When you have an account and register a debit card or credit card, you can purchase and download songs online. You can also rip songs from the discs that you own or borrow from friends and transfer those files to your account. Spotify can also locate music files in your own library and add those songs to your account. Searching for music is easy because the app gives you so many options. While you can search by artist or band name, you can also search by album title or song name. 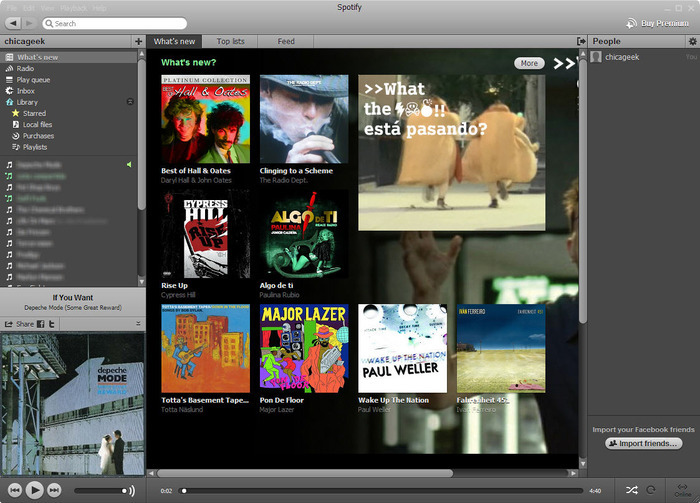 If you like a specific genre, Spotify lets you search for music from that genre. You can also enter the names of artists you like and let the app recommend new artists. One of the top features of Spotify is that it comes with like and dislike buttons. As you listen to songs on the radio, you can click the like button to let it know that you like the song. Pressing the dislike button lets it know that you don't like the music and keeps the app from playing that song later. The more songs you like, the more the app will learn about your preferences. The free version of the app plays ads in between songs that function as commercial breaks. You'll often hear the same ads over and over again. You may dislike that the app doesn't have all songs available as downloads and that you need a credit/debit card to buy music. The premium version of Spotify removes ads.